The obesity conference in San Diego is over. Highlights included plenty of interesting lectures, dinners with Jimmy Moore (thinner than ever after a year of measuring his ketone levels) and Dr Jeffry Gerber, drinks and NuSI-talk with Gary Taubes (exciting news coming up) and discussions with the insanely impressive Dr Peter Attia (who recently recieved a standing ovation at TEDMED – video to be posted). And one more thing… surfing in the Pacific Ocean with ASBP president-elect Dr Eric Westman. In less than one week it’s time for this year’s low-carb cruise in the Carribean, so it was hardly worth flying home to Sweden before that. 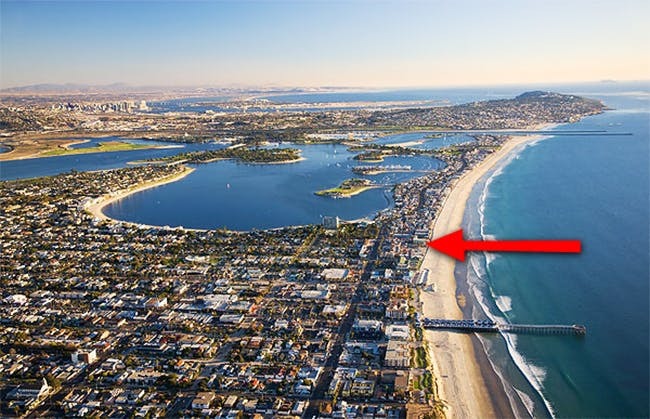 To spend the time in between I checked into a small hotel on Pacific Beach, San Diego, where I’m writing this (by the arrow above). Life’s not too bad. Oh Andreas.......I'm soooooooo Jealous! :-D. Enjoy! Good doctor, if you have some time while in San Diego please let me know. I live 5 min away from where you are staying. I have been following your blog for a while now and it is a favorite of mine. See you on the cruise! And I'm just a few hours north of you too. Bloody hell! Not speaking to you now. Enjoy Dr Eenfeldt! Special thanks from Montréal for your wonderful work! Welcome to So. Cal I really hope you enjoy it here. San Diego is a gorgeous place. I live in Orange County which is about 2 hours north of where you are (just south of LA). I HIGHLY recommend taking your lady on a horse drawn carriage ride through the gaslamp district if she is with you. Also they have a phenomenal zoo with all kinds of cool stuff. They even have a safari at the zoo where you can see the animals safari style. Can't wait to see you guys!! Big hugs!!! While you have some time hanging in San Diego, take a look at this video and tell us what you think about what this guy is saying. According to the study, eating one egg is "just" as bad as smoking 5 cigarettes a day for 15 years! Who did this study? Doc has alredy done that! Im not suprised anymore what they can come up with.. without losing there credebility! I’m annoyed now, wish to go back to San Diego and do surfing or enjoy cruising in one of my favorite cruisliers. But its not possible now, my granny is admitted in the hospital. so I have to wait for her, until she gets back on her feet. I’m missing Sand Diego, but soon I’ll be there again and enjoy my leisure time. I live in the UK and I've forgotten what blue skies look like. I want to move to San Diego! !